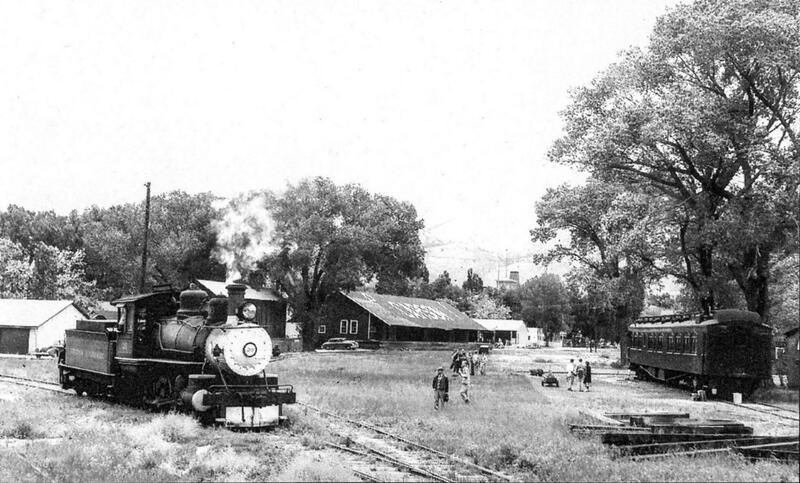 This view shows the railroad tracks on the east side of Carson City. On the left side is V&T Locomotive #26, coming from the leg of track that ran down Stewart Street and headed south out of town towards Minden. On the right side is the private coach "Gold Coast," owned by author Lucius Beebe. He used the coach as his residence while he lived in Carson City writing books about the V&T. In the middle distance is the V&T's Carson City Freight Depot, at the corner of Caroline and Plaza. The locomotive is probably headed back to the depot, which is located beyond the trees to the right. It could be using the wye that is formed by all these criss-crossing tracks to turn around.